AICOK GS-336 is one of the cheapest dual-speed centrifugal juicers available in the market. If we’ll do the math, it’s 60% less expensive than the Juice Fountain Plus. That will leave you a significant amount of spare cash ready to be spent for a week’s worth of produce. That is quite impressive, but this product or the brand itself has some red flags that are hard to ignore. Let’s start with the brand name itself. Its website says aicok.cc but it points to an Amazon product listing bearing an AICOOK logo. To my surprise, there’s also an aicook.cc website. It sells the same set of kitchen equipment but lacks social media following, the products don’t have proper model numbering, and some links are not working. The single “O” website looks and feels more legit, but IMHO, AICOOK sounds better than AICOK. They should have skipped using a .cc extension; it’s a wildly spammed top-level domain. Update #1: The company responded back to me confirming that they are both behind those websites or brands. The official brand is AICOK, having AICOOK as its subsidiary. Now let’s jump to its product features. All the juicers in their portfolio are being marketed as BPA Free, but it has no mention of the exact plastic material used. I can’t vet whether it’s true or not. I’m looking for Tritan or ABS plastic which is often used by popular juicer brands. They also stated in their Amazon product page that the chute of AICOK GS-336 is 3 inches wide. In their website, however, it says 65mm which is half an inch shy of a full 3in diameter. Furthermore, listed in the features of this juicing machine is its ability to process soft fruits. It’s highly unlikely since its low-speed setting plays between 12,000 to 15,000 RPM. This range is the top speed setting for most of the centrifugal juicers I have reviewed. In light of fairness, I’ve reached out to the company. Until then, I won’t classify their products as BPA free and to minimize confusion; let us treat AICOK and AICOOK as the same companies moving forward. Update #2: The company said that they use ABS and AS plastic in their products which are BPA Free. Let’s say all the features of AICOOK GS-336 are accurate. Considering its price, I can’t deny the fact it’s the best machine you can get for your money. It is not equipped with a safety locking mechanism. Make sure that the machine is turned off when you’re assembling it to avoid any injury or damage to the juicer. This juice extractor is prone to overheating; you can only run it continuously for a minute then you need to cool it down for 2 minutes. There is no mention if the detachable parts are dishwasher safe, so let’s assume it’s not. AICOOK GS-336 is not equipped with a safety locking mechanism as stated in the Amazon product page. You will have to operate this two-speed centrifugal juicer with caution. As I said in the cons section of this review, you’ll have to make sure it’s turned off before putting it together. Taking this necessary step will prevent any damage to the juicer and more importantly injury to the user. Centrifugal juicing machines are usually easy to use, but with this major setback, this product won’t have a user-friendliness badge. The manufacturer didn’t mention if the detachable parts of this juice maker are dishwasher safe. Though it’s not a big deal, it will add a little bit of complexity to your cleaning routine. To make things easier, you can follow these tips. Place a biodegradable plastic in the pulp receptacle. Now you don’t have to wash the pulp bin, all you need to do is rinse it. Clean your juicer immediately after use. It will prevent any residue accumulation that is going to harden if left unwashed. If you want to be thorough, soak the parts in warm water with a dilution of soap or baking soda for 30 minutes. This will soften any residue buildup. Centrifugal juicers like the AICOOK GS-336 doesn’t excel in the juice quality department, let alone its juice extraction efficiency. High RPM is the main culprit to this letdown. Thousands of revolutions per minute incorporate a lot of air into the juicing chamber during the extraction process. Being one of the fastest centrifugal juice extractors, it incorporates more amount of oxygen than other models in its class. Expect your juice to be a whole lot frothier when using this machine. Oxygen, by the way, is the main catalyst of oxidation which causes your nutrients to break down or spoil. This high-speed juicer can overheat if used for more than a minute. The heat can destroy some vitamins and minerals in your juice. If you’re not careful with this juice extractor, your expensive produce will go to waste. What Kinds of Produce Can the? Because of its extremely high RPM, this fast juicer is only suitable for basic juice recipes. You are only limited to juicing hard produce and citrus fruits. Hard fruits and vegetables include broccoli, cauliflower, bitter gourd, carrots, turmeric, fennel, ginger, garlic, apple, pepper, pear, pumpkin, yakon, cilantro, beets, pineapple, watermelon, sweet potato, celery, cucumber and asparagus. Citrus fruits like mandarin, grapefruit, lime, tangerine, orange and lemon also work well with this machine. Don’t waste your leafy greens and soft fruits on this high-speed juicer. 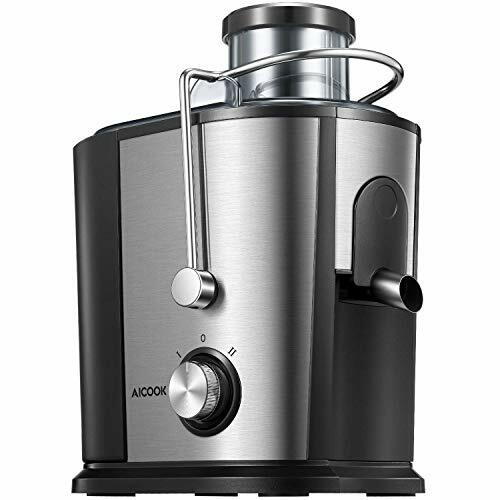 After finishing this review, I can’t really recommend AICOOK GS-336 Wide Mouth Juice Extractor to anyone not even to first time juicers. It is not a safe product to begin with. Though it’s cheap, it has a lot of flaws. If you’ve read the entire article, you’ll see what I mean. The newer AICOOK GS-332 is far better than this model, and as well as the AMR516-1. There are also some other great cheap juicers out there like the Cuisinart CJE 1000.